Admittedly, Treat is not a band I am all too familiar. I have run across the name but I don’t think I ever heard any music from them. In fact, going by the name, I would have figured they were a campy glam rock act like The Sweet. Then I did a bit of research on them and saw their album covers from the ’80s that make them out to be in the glam metal mold. Judging by this album, Coup De Grace, they are much closer to 1980s glam metal than 1970s glam rock but this album doesn’t try to relive the past, this is the type of melodic hard rock that the Frontiers label is known for. I hate to make this comparison but Treat sounds very similar to their fellow Swedes Europe. This is the group’s “reunion” or “comeback” album, if you will. They got back together in 2006 and this is their first studio effort since then. Their last original material was in 1992. I have read the band was indeed involved in the typical “booze and babes” lyrics of the ’80s but that they specifically set out to sound a bit more grown up on the lyrics here which are much more in line with the usual uplifting anthems about love and believing in yourself that you can expect from a melodic rock band. 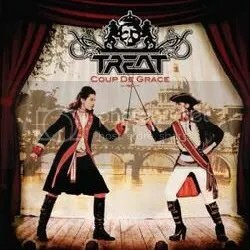 This isn’t a bad thing at all and compared to most melodic/AOR bands, Treat is pretty heavy, putting them in a class close to House of Lords. I don’t know how well this album stacks up to their past glories, but going in cold, I’ve really enjoyed this album. There are a few lackluster numbers. “Prelude: Coup De Grace” is an unnecessarily long intro and the album’s only true ballad “A Life to Die For” did nothing for me but they are more than made up for by hard drivin’ numbers like “All In”, “Paper Tiger”, “Roar”, “Tangled Up”, “I’m Not Runnin'” and “Breathless”. Anyone with a taste for melodic hard rock should give this album a listen. I like it so much I plan on checking around to see what else from their back catalog is available.